We are happy to announce our partnership with City of Boulder’s Open Space & Mountain Parks and Wild Foundation to plant 200 root stocks for two Native Forage Buffer Zones! An important part of this project will be to see what wildlife benefits from these two planting areas. To find out, we need to purchase (or borrow) three Wildlife Trail Cameras. We have one already set up, but we need two at both sites. The type of camera we are looking at purchasing is the Browning Recon. The cost of the camera, security box, and lock will run us about $200 per camera set-up. If you have a Trail Camera (it does not have to be the Browning Recon) that we could borrow until the bears go into hibernation (approximately end of October) we would be so grateful! Contact us at brenda@boulderbearcoalition.org or call us at 303 246-4544. If you would like to donate to help fund the purchase of a camera set-up we would also be very grateful! Just go to our donate page! Human-black bear conflict has received increased media attention in recent years, and urbanization will likely continue to displace bears from their natural habitat and increase conflict in urban areas. In response, three local Boulder organizations are exploring the use of a native species foraging buffer as a way to reduce human-bear conflict in urban areas. On April 20th, 2017 Boulder Bear Coalition (BBC) and the WILD Foundation (WILD) worked with the support of the City of Boulder’s Open Space and Mountain Parks (OSMP) team to select two forage buffer sites located in the foothills of City Open Space; one in a Habitat Conservation Area, and the other in a designated Natural Area. With much of the bear migration occurring into urban sections of northwestern Boulder, this pilot project focuses on enhancing disturbed habitat in the adjacent natural areas. As the planted forage buffers mature, fruit will grow and provide food for hungry black bears. This habitat enhancement program aims to accelerate production and recovery of fruit-bearing shrubs in natural black bear habitat. By augmenting natural harvests, bears may be less prone to migrate into urban environments in search of food, thus reducing their presence and interaction with humans within the city. Even though such buffers are for the purpose of black bear stewardship, forage buffers will also benefit birds, insects and all wildlife that depend upon native shrubs as critical habitat. With similar landscape and vegetation types identified, this pilot project will also support OSMP flood restoration and vegetation efforts, as both areas experienced severe damage due to the fall 2013 flooding. Plants were based on the bears’ natural diets and instinctive movement across boundaries, specifically between designated habitat and urban environments. 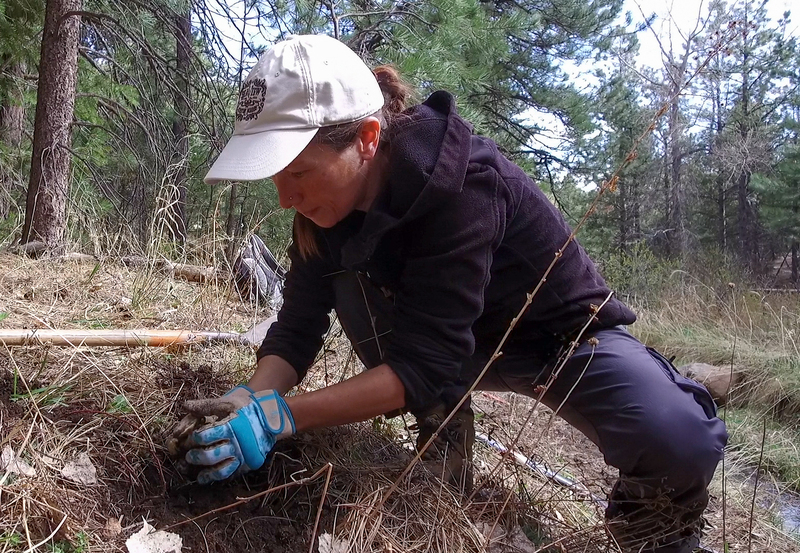 Working with the City of Boulder OSMP’s restoration plant ecologist, Megan Bowes and her team, more than a dozen BBC and WILD volunteers planted over 200 native plants between the two sites. The timing of this project proved to be especially meaningful, as Boulder is experiencing an early spring, and corresponding early bear activity. This serves as an important reminder for residents to be proactive in reducing human-bear conflicts: properly secure trash and compost bins, bring bird feeders in for the season, and harvest nearby fruit as it begins to ripen. Taking these simple steps to bear-proof homes will protect local black bears and keep the Boulder community safe.